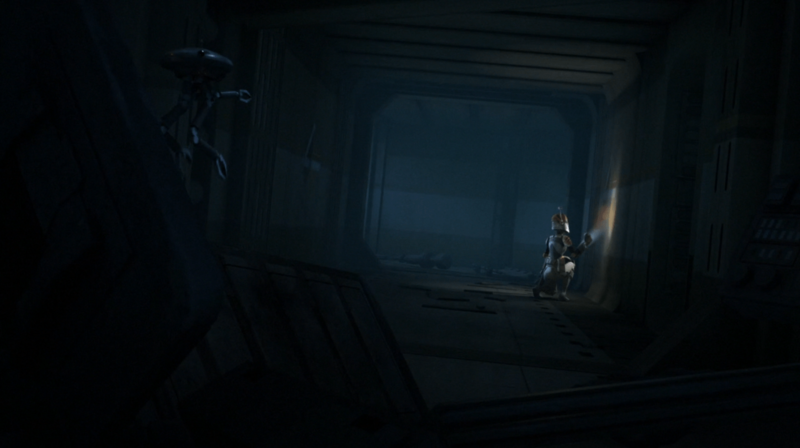 The third episode of season 2, “Always Two There Are“, gives us the first horror story in Star Wars Rebels. We got a few scary stories in The Clone Wars with zombie Geonosians. The exploration of fear has long been a theme in Star Wars – from Tarkin’s doctrine of ruling through fear to Anakin’s fear of loss in Revenge of the Sith. What better way to explore fear than a haunted house story a few days before Halloween? 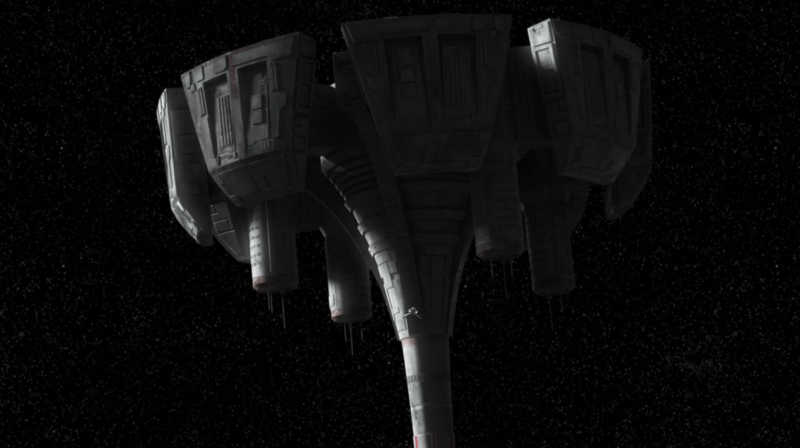 The bulk of the action in the episode takes place on an abandoned medical station once used by the Republic. It’s similar to the ones we see used in The Clone Wars – not at all surprising – but it’s striking just how creepy the interior can be when turned into a dilapidated, abandoned mess of its former self. Space can be a lonely, desolate place. Watching “Relics of the Old Republic” and “Always Two There Are” back to back is an excellent lesson in cinematography. Both episodes make great use of the camera to convey mood and tone. Where Relics emulates the slow, methodical shots of classic submarine movies for drama and tension. “Always Two There Are” uses off-kilter camera angles to create a sense of unease and disquiet. The narrative on the station plays out in classic haunted house fashion – the characters enter a creepy, abandoned place only to slowly realize they are not alone and are, in fact, trapped with a malevolent force. Chopper chases after strange noises. Zeb gets lost in the twisting corridors. When the enemies hunting the rebels finally reveal themselves as Inquisitors, things do not go well for our heroes. They are each captured or injured in rapid succession. In the end, they manage to escape through subterfuge rather than confrontation. In combat, Ezra, Sabine, and Zeb are clearly outclassed by the Inquisitors. The off-kilter angle is unsettling and a staple in suspense films. 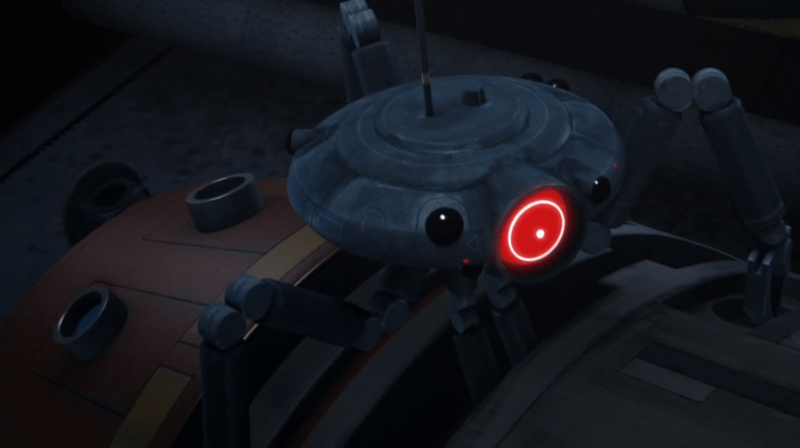 The most disturbing moment of the episode for me was when a seeker droid plays Chopper like a puppet to send a distress call to the rest of the rebels. It actually really bothers me the way it sticks its pincers into Chopper’s body and starts moving things around to make Chopper talk. Seems unnecessarily gruesome to me. Seeker droid plays Chopper like a puppet. We first saw The Fifth Brother at the end of “Relics of the Old Republic” in a brief scene as he arrives on board Admiral Konstantine’s Star Destroyer. 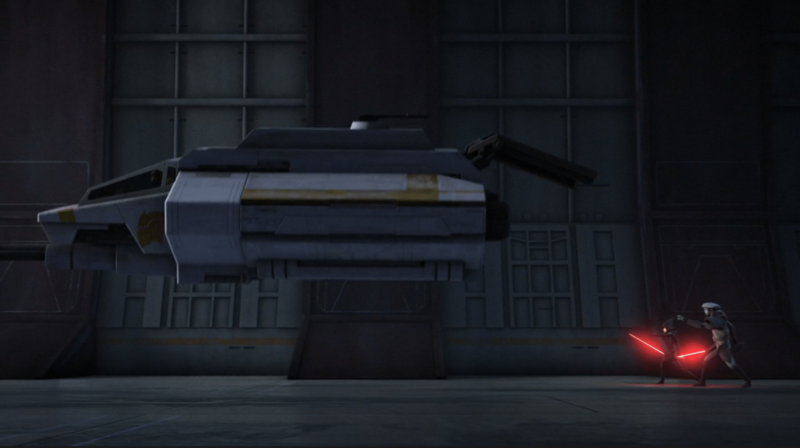 This episode sees him in action and also introduces a second Inquisitor hunting the rebels: The Seventh Sister. The two are substantially different. The Fifth Brother is rash and quick to violence, relying on his size and power. He is direct and immediate. While in action he is constantly in motion, never stopping. In quieter moments of reflection he sits stock still. The Seventh Sister is more calculating, devious, and manipulative. Where The Fifth Brother simply wants to kill Ezra, The Seventh Sister plans to use him as a means to a greater goal – Ahsoka Tano. Her fighting style emphasizes her agility and speed more than power. She also relies on her small army of seeker droids to gain the upper hand. Physically, their movements seem inspired by animals. Fifth Brother’s slow, purposeful meandering turns into a sudden, violent burst of speed. It reminds me of a shark patrolling its waters. Seventh Sister is more angular and unsettling in her movements – she perches with her knees akimbo and weaves her lightsaber in an eerie pattern as she stalks forward. It’s hard not to compare her to a spider. Working together, the Inquisitors can stop a ship. Both Inquisitors wield personalized versions of the spinning double-bladed lightsaber we saw The Grand Inquisitor wield last season – Seventh Sister reveals that Jason Isaacs’ character was The Grand Inquisitor of the Inquisitorius. What is fascinating about the Inquisitors is that they are shown to be in competition with one another. “The kill is mine!” Fifth Brother declares when Seventh Sister stops him from cleaving Ezra in twain. Seventh Sister even states that the death of The Grand Inquisitor presented opportunities to the rest of them. There are clear plays for dominance between the two of them through their interactions. The most telling thing about the Inquisitors is Kanan’s reaction when Ezra reports their existence. Kanan is shaken and speechless. Hera covers for him, deflecting the conversation neatly back toward military procedure, but Kanan is clearly rattled. I love this moment – Kanan losing the bravado and cocksure attitude he’s had through most of the series is very honest. More still, we see Hera step in to comfort him. Seeing them react to one another in such an emotional moment leads me to believe more than ever that they are a couple – it’s just not made to be a big deal or defining element of the characters. A tender and romantic moment of comfort. Sabine Takes Command. This is the first time we see an official rebel mission underway without Hera or Kanan there to act at field commander. 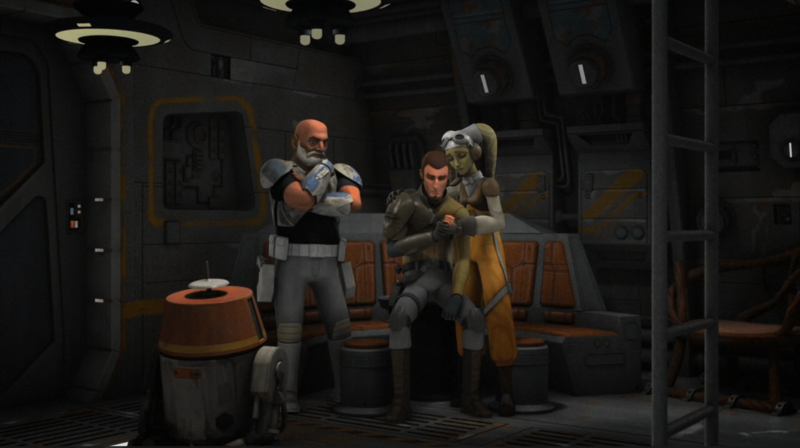 Sabine is tasked with recovering medical supplies and given command over Zeb and Chopper. While there isn’t much as far as tactical planning and execution, it is a sign of Hera’s trust and shows maturity on Sabine’s part. Zeb learns wits trump brawns. As the muscle of the group, Zeb is the most likely to punch his way through a problem. Thing is, not all problems can be punched. He learns a nice object lesson in fighting smart, especially when victory means just surviving. Ezra’s two dads. Kanan and Rex don’t get along, as we saw in the first two episodes this season. Unfortunately, the battlefield they’ve chosen for their contest of wills is Ezra’s continued training and development, a battlefield Ezra finds irksome. The two get into an argument, obviously not the first, and Ezra joins the away team rather than stay and be fought over. This seems to be a long-term source of conflict in the team. The only good thing is that as soon as there was a more serious issue, the revelation of more inquisitors, the two set aside their quarrel, Kanan and Rex can function as a team when it’s needed. Ezra the hero. This season continues to demonstrate how far Ezra has come as a person since his introduction in Spark of Rebellion. He’s finally reached a point where he’s comfortable with the crew and welcomed as a valued member. What’s more is we see him make noble self-sacrifices in this episode. Ezra is maturing well into a good young man. This is easily the episode of the season so far and matches all but the finale of last season. Five stars. This entry was posted in Rebels in Review, Reviews, Star Wars, TV. Bookmark the permalink.